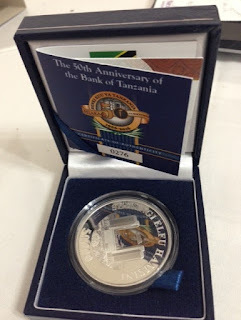 African Coins & Banknotes: Tanzania (2016) Commemorative coin to mark "50 years of Bank of Tanzania"
Tanzania (2016) Commemorative coin to mark "50 years of Bank of Tanzania"
On 14th June in 1966 marked a major turning point in Tanzania’s economic landscape as the Bank of Tanzania started its business as a central bank of the United Republic of Tanzania. On 14th June 2016, It commemorate the 50th anniversary of this important institution. As Tanzania celebrates, It is time to reflect on the role and functions of the Bank, as It has evolved over the past 50 years. The reflections will enable the public to understand where the Bank came from, where it is now, and where it is heading. It is important to note that the Bank’s role and functions have changed substantially, matching with country’s changing socio-economic policies and developments in the international economic and financial system. Despite the challenges encountered over the past five decades, the Bank has managed to discharge its duties and responsibilities effectively.